Riverstone - No city taxes or HOA dues! Move right in! MLS#2247400. 4025. Brittany Woods - Brand new complete Trane system w/10yr warranty MLS#2248394. 4883. 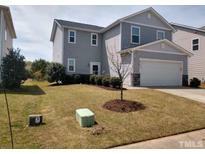 Coblestone - This home is very convenient to all amenities in Clayton. MLS#2249552. 1854. Little Creek Farms - Fenced yard, fire pit huge lot! WON'T LAST! MLS#2249393. 2739. Ives Landing - Too many unique upgrades to list! A MUST SEE! MLS#2249337. 1819. The Falls At Norwood - COMPLETELY REMODELED~BETTER THAN NEW CONSTRUCTION!This gorgeous home has 4 bedrooms,theatre Room,craft Room,heated & cooled detached garage w/office,bath & closet above!Upgrades include all new granite tops in kitchen,master bath & mud Room!New modern lighting,new plumbing fixtures,new tile backsplash,new paint,2 new HVAC systems,new hot water heater and the list goes on and on!Home sits on over an acre lot,has stamped concrete sidewalk & patio,huge screened porch w/Trex flooring & much more!MUST SEE TO BELIEVE! ! MLS#2249196. 1197. You don't want to miss this one! MLS#2249066. 4061. Large back yard for sunny garden and detached garage with plenty of shelving and workspace. MLS#2248459. 4852. All in a location convenient to downtown Clayton, Garner and Smithfield. MLS#2249147. 1197. Glen Laurel - This home has a new roof and a 1 year full home warranty. MLS#2249047. 2989. Matthews Farm - 3BR/2.5Ba 2 Story House with Over 2300 SF* Rocking Chair Front Porch* Foyer* Hardwood Floors* Island Kitchen features Tons of Cabinets, Granite Counters & Pantry* Sunny Breakfast Nook* Formal Dining Room w/ Tray Ceiling* Family Room w/ Gas Log Fireplace & Ceiling Fan* Huge Finished Bonus Room* Lush Master Suite w/ Vaulted Ceiling, Ceiling Fan, Walk in Closet, Soaking Tub & Separate Shower* Storage Building* Screened Porch* Fenced Back Yard* Close to I 40, NC 210* MLS#2247728. 1768. Cobblestone - Upgraded features include fresh interior paint and new carpet in select rooms. MLS#2249026. 4823. Georgetown - NEW Laminate flooring throughout 1st floor, NEW carpeting, NEW Water heater! Owner is Licensed NC Realtor. MLS#2248935. 4182. Large yard with a separate storage building. Fenced Back Yard. MLS#2248834. 1716.